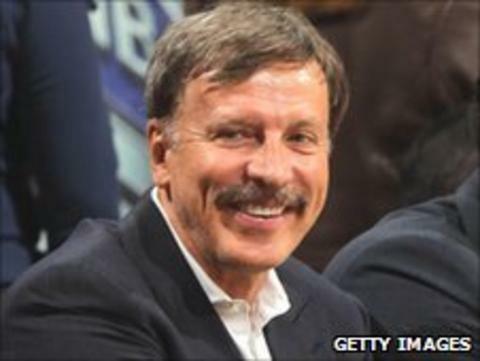 Arsenal say the Premier League has given approval to the takeover of the club by American Stan Kroenke. Kroenke Sports Enterprises (KSE) bought additional shares last month to acquire a near 63% controlling interest in the Gunners' parent holding company. As obliged, Kroenke made a formal offer for the remaining stock at £11,750 a share but has had no takers. Kroenke has now given a formal 14 days' notice for the closure of the unconditional offer. Uzbek oil magnate Alisher Usmanov, who owns 27% of the club through Red & White Holdings, has indicated he will not sell, while the Arsenal Supporters Trust have urged all minority shareholders not to cash in. Arsenal chairman Peter Hill-Wood said: "The club is very pleased to announce that the Premier League Board has confirmed that the change of control processes under the rules of the Premier League have been concluded to its satisfaction in relation to Stan Kroenke's control of the club. "KSE's offer for Arsenal Holdings PLC is wholly unconditional and we now look forward to a new and exciting phase in the life of the club. The plan is to maintain the PLUS listing provided there are a sufficient number of shareholders for that to be permitted." Kroenke first bought 9.9% of Arsenal's shares in 2007. He accepted an invitation to join the Arsenal board in September 2008 and increased his holding in the club with the acquisition of the stakes of Danny Fiszman (16.1%) and Lady Nina Bracewell-Smith (15.9%) in April. Arsenal is only one of the sporting teams in his portolio, which also includes American outfits the St Louis Rams of the National Football League, the Denver Nuggets of the National Basketball Association, the Colorado Avalanche of the National Hockey League and the Colorado Rapids of Major League Soccer. "As the controlling shareholder of Arsenal football club, it will always be our intention to do what's necessary to assure success on the pitch, provide long-term stability and build on the accomplishments and history of the club," said Mr Kroenke. "We recognise that overseeing the operations of the club is not only a privilege but a responsibility that will require attention and dedication as the club strives to reach all of our goals on and off the pitch. "We will continue to grow the club's presence globally while also adhering to the club's self-sustaining economic model. "The club has funds to invest and will do so wisely. Our constant aim will be to compete for silverware and championships. "The long-term health of the club is of utmost importance and the board, chief executive, manager and the wider team will be working hard to achieve success for the club and our fans, and to play our part in our communities in north London and beyond. "Arsenal is not about one shareholder, one player or one fan. It's a special institution and we look forward to celebrating that further during the 125th anniversary year of the club."